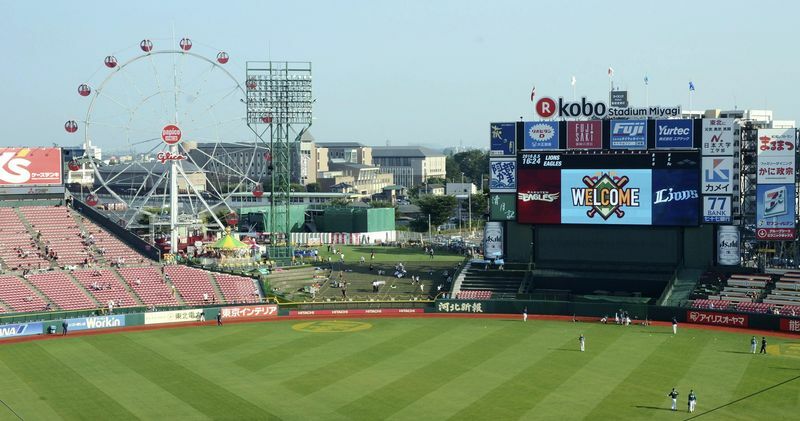 The Ferris wheel and merry-go-round are seen behind the left field stands at Kobo Stadium Miyagi. September 07, 2016　By Yukihiro Fukai / Yomiuri Shimbun Sportswriter SENDAI — The changing fortunes of a pro baseball team might make the fans feel at times like they’re on a roller coaster. Those watching the Tohoku Rakuten Eagles play at their home stadium could feel they were actually at an amusement park. Kobo Stadium Miyagi, the home of the Pacific League’s Eagles, has been more than a ballpark this season. This spring, it became the first baseball stadium in Japan to construct a Ferris wheel, then further boosted its entertainment appeal by adding a merry-go-round in August. In a corner behind the left-field stands, the wooden horses and carriages slowly make their circuit. Children take delight at the fairy-tale scene that contrasts with the serious competition unfolding on the field. The ride requires an extra fee in addition to a game ticket, but is popular enough that lines begin to form before the first pitch. The colored lights add to the vividness when illuminated during night games. The average attendance at Rakuten home games up to the mid-season break was 23,038, an increase of 1.4% over last year. Though the team is fourth in the standings, eight games out of third through Sunday’s games, the Ferris wheel has helped to keep the fans coming. The stadium has added other amenities. A barbecue area was opened in the plaza behind the left-field stands in July, and an outdoor cafe was completed at the end of August. It seems the process of creating a unique stadium will continue.